Monarch butterflies are rare visitors this summer. In a typical year, they float through the backyard all day. 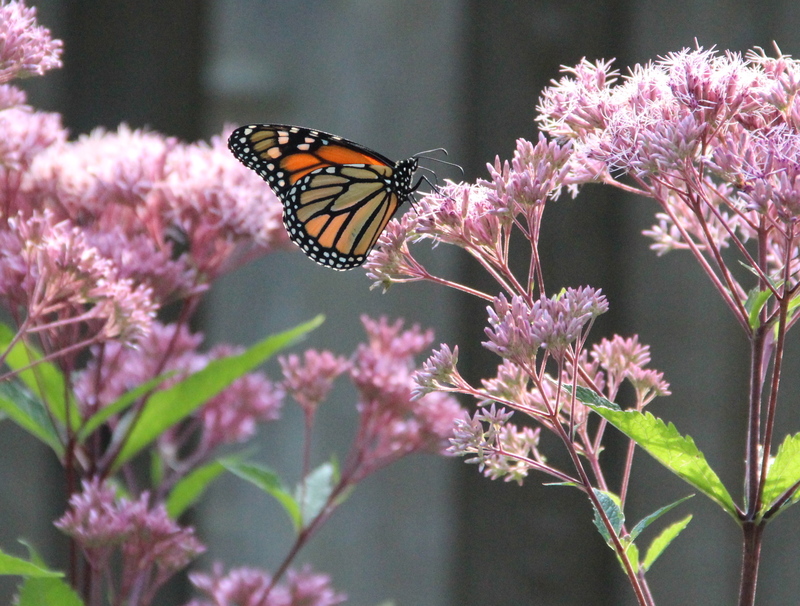 Over the past week, a solitary monarch visited our patch of spotted Joe-Pye weed (Eutrochium maculatum) each day between 7 and 8 a.m. Sunlight glowed in its beautiful wings as it sipped the Joe-Pye nectar. A monarch sips Joe-Pye weed nectar in early-morning sunlight. In the next two weeks, monarch migration through St. Paul, MN, should peak, according to MonarchWatch.org. To check peak migration in your own area, visit peak migration. During the 2011 fall migration peak, 10-to-25 monarchs visited our Joe-Pye patch each afternoon, and often roosted in our apple tree for the night. I’m interested in comparing this year’s numbers with the 2011 observations. (Last year, the Joe-Pye blossomed two-to-three weeks earlier than usual, due to the early spring, and as a result, finished blooming ahead of monarch migration. In addition to the low numbers of monarchs, I’ve only seen one each of black swallowtails, red admirals and mourning cloaks, and only two tiger swallowtails in our garden. I haven’t found caterpillars of any of the five species. Read more about the low number of butterflies this year, from the Star Tribune. This entry was posted in Butterflies, Insects, Wildflowers and tagged Joe-Pye weed, monarch migration, monarchs, Saint Paul Minnesota. Bookmark the permalink.